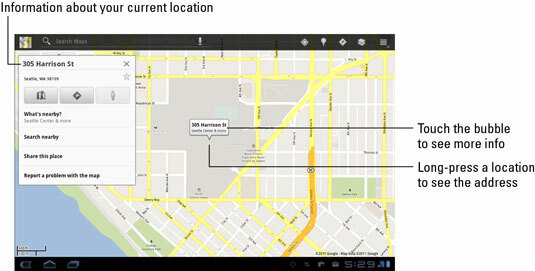 It’s possible to use the Maps app on your Galaxy Tab to send your current location to a friend. If your pal has a mobile device (phone or tablet) with smarts similar to the Galaxy Tab, he can use the coordinates to get directions to your location. Maybe he’ll even bring some goulash! Long-press your current location on the Map. You see a pop-up bubble. Choose the command Share This Place from the pop-up window. Choose either the Gmail or Email item from the Share This Place menu. The Gmail or Email app starts, with a preset subject and message. The subject is your street address or the address of the bubble you touched in Step 2. The message content is the address again, but it’s also a link to the current location. Type one or more recipients into the To field. Touch the Send button to whisk off the message. When the recipient receives the e-mail, she can touch the link to open your location in the Maps app — providing that she has a Galaxy Tab or some other mobile Android device. When the location appears, she can use her device to help her get to your location.